Trigger point dry needling is used to manage discomfort and to stimulate muscle function. It is a skilled manual therapy intervention in which a very thin sterile needle is inserted through the skin into the muscle, and is directed into a myofascial trigger point. Inserting a needle in the trigger point will cause a “twitch” of the muscle and eliminate pain being felt in this area. 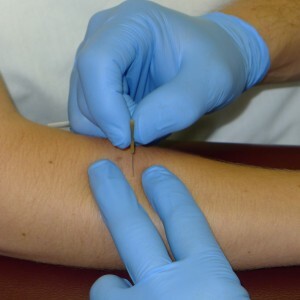 Dry needling is a technique used to treat dysfunctions of skeletal muscles, fascia, and connective tissues. It reduces or restores impairments of movements, of function, and body structures. Which leads to improved activity and participation. Dry needling can significantly reduce your pain and restore function. It will make it possible for you to increase your activity level and get back to your normal routine. We at The Therapy Network are determined to get you back to enjoying life again. Our goal is to get you in shape to walk around the block again, resume playing golf, work out, or participate in competitive sports. You can trust years of cutting-edge experience when you call TTN for Dry Needling services. Lead therapist, Erik Wijtmans, PT, MTC, CGIMS, CMTPT, was one of the first physical therapists in the United States to become certified in dry needling. His expertise has enabled him to teach nationwide for years, where has trained hundreds of other therapists.